Fabricio Werdum thrives as the underdog. Werdum will once again fill the role when he meets Cain Velasquez for the undisputed Ultimate Fighting Championship heavyweight crown in the UFC 188 main event on Saturday at Mexico City Arena in Mexico City. Beating long odds are nothing new for the two-time Abu Dhabi Combat Club Submission Wrestling World Championships gold medalist; he faced them ahead of his historic submission victory over the great Fedor Emelianenko in June 2010, when he handed the Russian legend his first defeat in nearly a decade. The road to Werdum’s unification bout with Velasquez can be traced to a lower-middle-class upbringing in Rio Grande do Sul, Brazil, where life was made up of difficult challenges, a lot of hard work and some good luck. The third child born to parents Verlau and Celia Maria, Werdum grew up in Porto Alegre in southern Brazil. Together with brother Felipe and sister Fabiana, he enjoyed a nice standard of living but always had to work to have his own money. That necessary work ethic had him working in a shoe shop in 1998, when he met a girl named Luciana. The chance meeting would forever change his life. Though he had no idea what the man meant, the then 20-year-old Werdum accepted the challenge. The experience made an impression. Werdum decided to enroll at the Winner Behring Jiu-Jitsu Academy, where Marcio Corleta -- he was a black belt under Rickson Gracie proteges Silvio and Mauricio Behring -- began his formal training in 1998. Two years later, Werdum was no longer dating Luciana, but thanks to her, he had discovered his real passion; he won his first Brazilian jiu-jitsu world championship in the absolute blue belt division in 2000. Werdum also made peace with the man who introduced him to the triangle choke. Corleta was impressed with Werdum from day one. By 2002, Werdum was on his way. He captured a pair of gold medals at the Brazilian jiu-jitsu world championships, winning the blue belt absolute and super heavyweight divisions. With his mother living in Spain, Werdum decided to relocate to Madrid to teach jiu-jitsu at the same academy as his brother, capoeira master Felipe Urso. However, Silvio Behring would not allow him to open an academy of his own because of his rank as a blue belt, so Werdum was forced to find a part-time job. It was during his training with the national judo team that Werdum’s engaging personality and excellent technique started to come together to open doors. Werdum’s first days as a Brazilian jiu-jitsu instructor in Spain did not go as he had hoped. Werdum returned to Brazil each year to compete in the Mundials and Copa do Mundo. He won world titles as a brown belt and as a black belt. His accomplishments led to more recognition, first in Madrid and later all across Spain. After Werdum received his black belt from Sylvio Behring, he decided to go to Los Angles to make his back belt debut in the Pan American Championships. There, another coincidental meeting altered his path once more. Upon returning to Spain, Werdum started to draw interest from European MMA promotions. He made his professional debut at Millennium Brawl 7 on June 16, 2002 and submitted Tengiz Tedoradze with a first-round triangle choke. 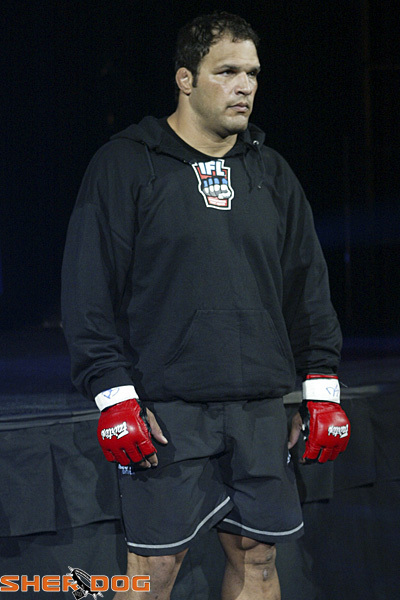 Werdum returned to the organization three months later and fought to a draw with James Zikic before tapping Kristof Midoux with another triangle choke at a World Absolute Fight Federation event in March 2003. However, he considers his fourth fight against Gabriel Gonzaga under the Jungle Fight banner his true MMA debut. His time being labeled as an underdog started five months later at Jungle Fight 2, where he met Ebenezer Fontes Braga, one of the most experienced strikers from the Ruas Vale Tudo camp. The only chance for Werdum, pundits believed, was to take down Braga. However, the Ruas Vale Tudo fighter stymied his attempts and completely dominated the first round. A knockout appeared imminent, but Werdum shocked onlookers 1:28 into round two.